For his workmanship and devotion to preserving valuable Chinese art legacies, Li was among the first workers in the city honored with the title of "Shanghai Standout." Filmed by Tang Dafei. Edited by Tan Xinru. Translated by Tan Xinru. Polished by Andy Boreham. Li Lingen, who was born in the rural Shanghai town famed as China’s “center of farmer art,” has become a master restorer of such distinction that ancient paintings he has rehabilitated are sought by collectors and museums far and wide. 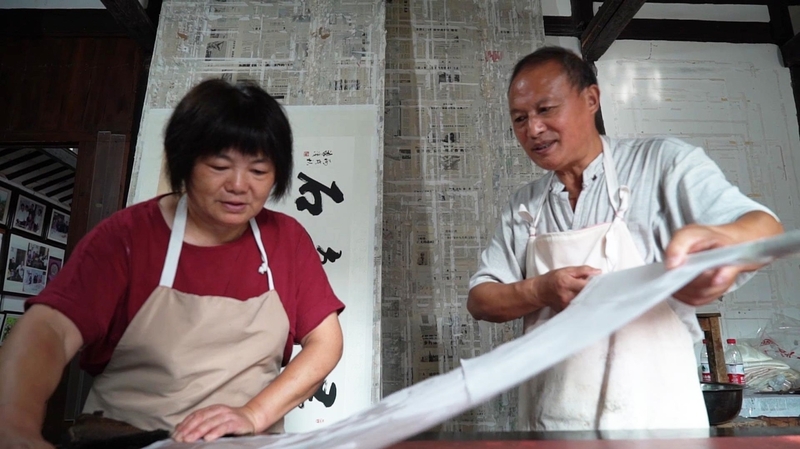 Li and his wife Li Jinhua, whose mother was a first-generation farmer painter, started their careers in art by framing paintings in a village workshop in the 1970s. Twenty years later, they began restoring ancient Chinese paintings and calligraphy for collectors, art houses and museums. Chinese artworks, painted on paper or silk, can become brittle in time. Some paintings brought to Li Lingen are literally in tattered pieces.